How Green Is Cordwood Building? Cordwood building is an alternative building method that uses stacks of firewood held in place permanently with mortar to create walls. Most people considering cordwood building are interested in its potential as a green building method. But how green is cordwood building really? The answer, like most questions pertaining to sustainability, depends on where you live and the techniques used when constructing your cordwood building. Cordwood building can have low embodied energy provided the wood used is local, or better yet, used from on site. Because the wood requires very little work before being used in cordwood walls, there is very little waste or energy consumed processing it. However, the inherent energy contained in the wood, combined with any distance that the wood must travel to the site, can increase the embodied energy significantly. The embodied energy represented by the wood pales when compared to the energy intensive mortar that is often used. Portland cement is one of the most high-embodied- energy materials used in building construction. It also causes significant pollution when it is manufactured. Some of these concerns can be addressed by using a cob mortar or a Portland cement that has a significant amount of fly ash in it. The R-value of cordwood building walls can be excellent, depending on the thickness of the walls and the insulation being used. The thickness of cordwood building walls can be adjusted for your specific climate with relative ease. However, the wood often shrinks within the mortar, creating cracks that can significantly reduce the R-value of the wall. Therefore repairs to seal cracks must be made to retain the insulating factor of a cordwood building. To figure out the real world R-value of a wall, talk to cordwood building homeowners in your area. The longevity of cordwood buildings is a matter of dispute. Proponents say most wood shrinkage and rot can be avoided with carefully choosing well-seasoned wood and creating overhangs to protect the walls. Detractors claim that even with these considerations the wood in the walls often rots, shrinks, and can be severely damaged by insects. Both sides agree that some shrinkage of your cordwood walls will occur, so it is important to know how to address these problems as they appear. Treating cordwood buildings to resist insects and rot is also a matter of debate. The most effective treatments are also the most environmentally unsound, but such treatments often extend the life of a cordwood building. More environmentally conscious builders are using plaster to protect the cordwood walls with mixed results. 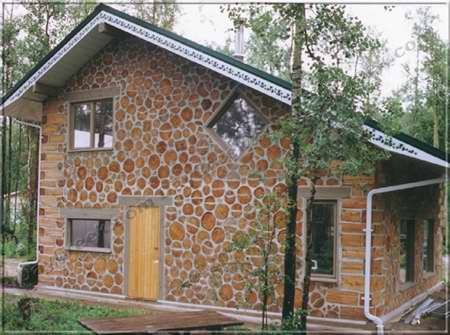 Cordwood building doesn’t require any material that would create any type of off gassing or air quality concerns. However, some homeowners who use the cordwood building technique use a sealant to further protect the wood. This can create off gassing depending on the type of sealant used. Because cordwood building remains such a unique construction method it may be difficult to get an experienced builder to work on a project using cordwood, while a novice builder may not know how to avoid problems of shrinkage and rot. If you do decide to use this construction method, be sure to research what common cordwood building problems are and how to avoid them.